Facial recognition technology is saving building services contractor 21st Century Contracts £140,000 a year – and is helping implement their health and safety policy. 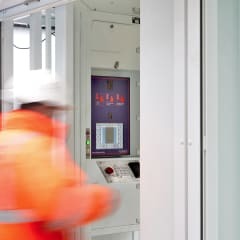 The company is using ClockFace time and attendance units from facial recognition specialist Aurora at three building sites to keep track of employee hours and to deliver important messages about training and accreditations. 21st Century Contracts Limited offers mechanical and electrical installation services and building maintenance for London and the Home Counties. The company turns over close to £17m a year, and employs up to 180 operatives on a number of different building sites. Laurie Driscoll, Senior Contracts Manager at 21st Century, says savings are being made because time and attendance data is now as accurate as possible, thanks to the effectiveness of the ClockFace units. ClockFace is a fast and highly accurate biometric facial recognition system, designed to clock operatives on and off site. The unit is capable of being sited in high-throughput areas, and users simply enter a pin code and stand in front of the hardware whilst their identification is verified in seconds. It’s during the clocking-on process that 21st Century operatives benefit from ClockFace’s messaging capabilities. “What we have done is to load all the information we have about each contractor onto the system – details about their Construction Scheme Certification Scheme cards, health and safety accreditations, Gas Safe, their public liability insurance, and more,” Driscoll says. Driscoll says 21st Century intends to use ClockFace units for any new large projects the company takes on.